Choices abound in the single-story Canopy. Flex space allows for a den, formal dining area, or fourth bedroom. After preparing meals together in the open kitchen (where you can be part of the fun in the Gathering Room), families can choose to dine and entertain in the interconnected café area or outdoor patio - which can become an optional covered lanai. Later, relax in the Owner’s Suite with walk-in closet. The Canopy floor plan is known for its remarkable open kitchen, which includes beautiful birch cabinetry and granite countertops. An interconnected café seating area provides space for casual everyday meals or a craft area. And when it’s time for relaxation, retreat to the spacious owner’s suite with large walk-in closet. 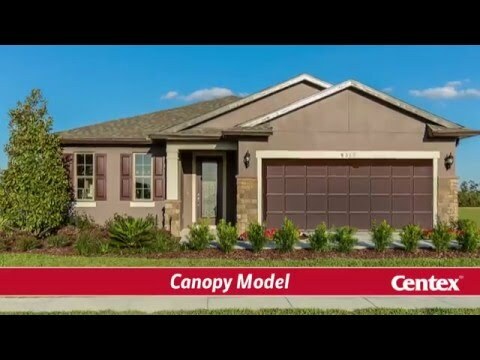 The Canopy floor plan offers choices to help this home meet your needs. Add a 4th bedroom, formal dining area or den in the flex space. The Canopy floor plan is known for its open kitchen, which includes birch cabinetry and granite countertops. An connected café seating area provides space for casual meals or a craft area.